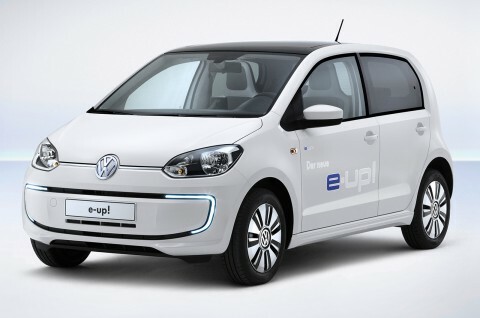 Volkswagen is to launch the production version of its e-up electric car. Volkswagen will be showcasing it at its Annual Press and Investors Conference in Wolfsburg, Germany before a public debut at the Frankfurt Motor Show in September. The e-up is based on Volkswagen’s up city car, a tiny hatchback that shares motorcycle parking spaces with the Scion/Toyota iQ and smart fortwo. Unlike those fashion accessories, the up! is available with four doors, making it a true four-seater. Motivation comes from an 80 horsepower electric motor and 18.7-kWh lithium-ion battery pack. Volkswagen says the e-up! will do 0 to 100 kph (0-62 mph) in 14 seconds and reach a top speed of 84 mph. So the e-up! isn’t really a Tesla Model S competitor. Still, the VW wouldn’t embarrass itself in a slow-motion drag race with the equally small Mitsubishi i-MiEV, which does 0 to 60 mph in 13 seconds and has an 80 mph top speed. Unlike its performance, the e-up’s range should impress. Volkswagen says it will go 93 miles on a charge, a big increase over the 80-mile range quoted in early reports. It also eclipses the Nissan Leaf’s EPA-rated 74-mile range. The e-up also comes with a nifty Combined Charging System (CCS). Like the chargers currently available for the Leaf and Model S, CCS can do a 30-minute quick charge, in this case restoring 80 percent of the battery’s power. However, it can also work with either DC or AC outlets, giving the VW driver more options.